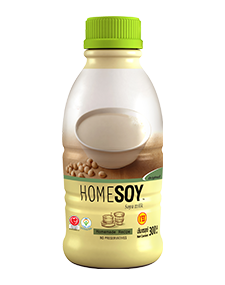 Homesoy Original is made from carefully selected premium soy beans from Canadian soybean which are then put through traditional methods of extracting soy milk, preserving all the natural goodness within. Homesoy Original’s fragrance and flavours will remind you of homemade soymilk. Homesoy is an appropriate and convenient beverage for health conscious, vegetarian or vegan consumers. Homesoy Original does not contain any preservatives, animal fats and dairy product.